Observation - Wasp - UK and Ireland. 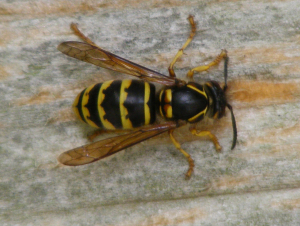 Description: This wasp is grazing on the a fence. It is chewing off the surface of the wood to make paper for it's nest. This is a very noisy process. It moves backwards as it works leaving a trail of darker wood. This wasp is grazing on the a fence. It is chewing off the surface of the wood to make paper for it's nest. This is a very noisy process. It moves backwards as it works leaving a trail of darker wood.